Once again I was fortunate to attend the New York Sheep and Wool Festival, affectionately known as Rhinebeck. This year was a wee stressful with an outdoor booth and a forecast of 40 – 60 mph wind gusts. There was a last minute booth move, fifteen minutes before the festival opened, when the winds really picked up, but in the end everything was okay. As usual I made it through with a little help from my friends. This year I made a squirrel knitting a sweater for the 2010 Rhinebeck mug. I totally forgot to take pictures before I packed them up and hit the road so the pictures above are of the last one before it was sent home with a very happy kniter. My apologies for the poor images – but you get the gist. It was a lovely time, I met SO many wonderful folks and I am so happy to have the opportunity to attend it. This entry was posted in Uncategorized on October 20, 2010 by Jennie. It was great to see you at the show, and to finally buy the mug I’ve been wishing I bought since I didn’t get one at Rhinebeck LAST year, and a gorgeous yarn bowl… and some buttons. Have I mentioned that I really like your stuff? Everything in your booth was beautiful! Major squirrel coveting…just sayin’. Lucky Rhinebeckers!! 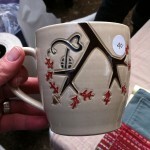 Got the chance to see your pottery in Rhinebeck last weekend. Absolutely love your pottery, especially the bowls with the knitting motif. The homebrew silk laceweight Framboise was absolutely beautiful; the way it shone in the sunlight, was definitely an eyecatcher. Please let me know when I can purchase more pottery (with the knitting motif) from your website. Thanks for all the compliments! I’m hoping to have work for sale before the holidays. Oh my goodness! I want one! I bought one of your lovely mugs at Sock Summit and I look forward to using it every.single.day! You are amazing! I was sad about not being able to go to Rhinebeck again but after seeing your mug I was really really really sad. 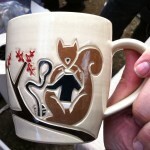 But I love the squirrel mug I bought when you were at the Wisconsin Fiber Fest. I can’t wait to see more pottery. I LOVE your squirrel mug!! Please let me know if you make any more, they are wonderful!